The Matilde Villa is located in the heart of the Amalfi Coast, about 100m above sea level, in the middle of green hills, among vineyards and lemon groves, with a breathtaking view of the most beautiful and evocative, as located in one of the extreme points of coast. The huge colorful landscape with the blue of the sea, forming a frame structure that makes it unique in its characteristics. Some convenient scale sharing the villa from the parking, making your stay more peaceful and relaxing. The favorable position offers an unforgettable holiday, and in a short time to reach the localities' most 'of the beautiful Costa. 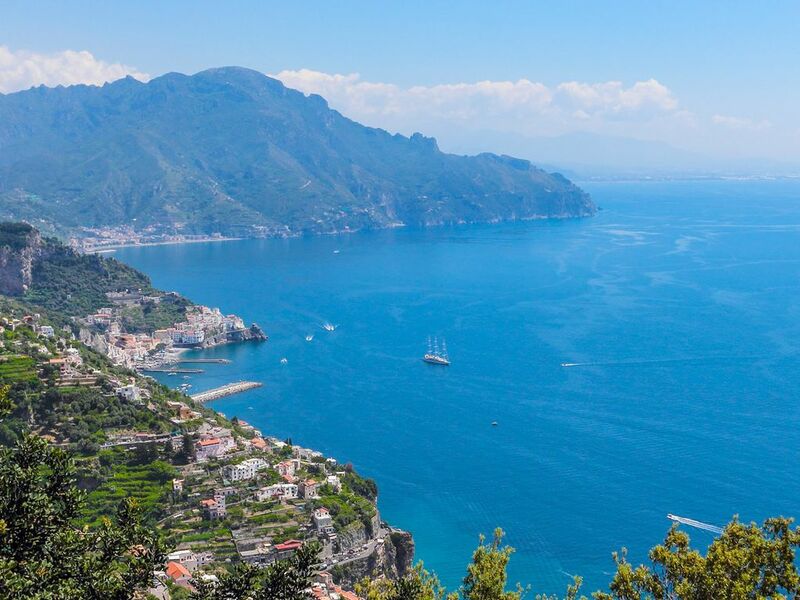 Amalfi, Positano, Sorrento, Capri, Pompeii, Ravello, are just a few minutes from the villa. Prices include everything. 10% discount weeks on successive.Depliant, brochures and maps of the location 'close, are available the guests in the villa. Arrivals Saturday / Saturday. Departures on Saturdays before 10.00. You will be accepted directly by the owner for the keys. Beautiful flat tucked in the town of tovere 15 minutes from the town of Amalfi. Roberto and his son Luigi where very helpful and accommodating. If you have transportation this is a great spot for a base camp to explore the Amalfi Coast. If you don't have your own vehicle be prepared for pricy taxis or waiting for the bus. This home was so perfect in every way.. as soon as we got there, we were immediately assisted into the house and given an overview on the entire apartment. The apartment is very spacious, and even more beautiful than the pictures.. we didn’t want to leave. I would 10/10 recommend this place to anyone and everyone, but also recommend to rent a car as it is about a 15min drive into the town Amalfi. We really enjoyed our time at Villa Matilde. I will start with the reason we have given 4 stars. This was simply the location, it may be my mistake but I believed the apartment was in Amalfi town, but it is in Tovere, which is a smaller town a little further along the coast. This would not be an issue at all if you have a car, but unfortunately we did not. Now on to all the positives! The apartment was very spacious, clean & had some nice touches. Roberto's wife had left us some champagne and biscuits as a special treat for David's birthday which was such a lovely surprise. They also provided bits for breakfast for the first morning & tea, coffee & other extra bits. The view was amazing, the balcony is such a lovely thing to have & the sea looked stunning. The view to Amafi is a little obstructed but still beautiful. Roberto is a fantastic host, he truly could not have been more helpful. He organised transfers for us to & from the airport. We then used buses to travel to Positano, Amalfi, Ravello & Bomerano (to start the Path of Gods hiking trail). There is a bus stop in Tovere (10 min walk from apartment), but the buses are infrequent. There is another bus stop on the main road (about 25mins down steps - medium difficulty) & another which is along the road (sloped - around 25 mins but slightly easier than steps). Roberto provided us with a timetable & it is worth downloading. SITA SUD is the bus company & they are reliable. The Amalfi coast is very quiet at this time of year & as we discovered, rather a lot is closed. As we were not in the main town, Roberto very kindly organised transfers (complimentary) to two restaurants for dinner - La Carcara, - very good fresh fish & they were so kind & helped celebrate my partner's birthday (balloons, a sign & a candle at the end - very sweet). The second was Pizzeria & Gastronomia Mascolo Agerola where the pizza was very tasty & so reasonable! We actually felt like they had only opened for us - but thankfully both restaurants were also doing takeaway! Our last night we wanted to go into Amalfi for dinner & Roberto kindly took us & organised a transfer back which was much more reasonable than a taxi. We cannot recommend highly enough this apartment. It is the best view and location, and the owners go out of their way to help you. We stayed in 3 different houses on our trip around Italy and consider this the best. Amalfi is a cute little beach side town, and this is a brilliant apartment. The view is more breathtaking than the photos could ever indicate and the apartment has everything we needed and more. Highly recommended. Very nice apartment and very nice people renting it to you. A lovely place to explore the Amalfi coast from. Roberto and Luigi were very helpful with any questions we had. Right outside your door there are wonderful trails and if you can handle lots of stairs the trekking is outstanding! We really enjoyed staying at Villa Matilda. Roberto and his son Luigi were very helpful with any requests we had, even taking us to a local store when the buses weren't available, and organizing a shuttle to a fantastic local restaurant. The hospitality tray with Anna Maria's excellent home made jam was appreciated, as well as Roberto's wine! The view is amazing. Roberto helped with the luggage from the parking area, there are steps, but they are gradual, not too steep, we didn't have any issue with them. It was cool when we were there, but Roberto made sure we knew how to run the heater. After we left, we discovered my sister had lost her camera case with sd card with photos from the trip on it. Roberto found it and was quick to let us know and even return it to her in Canada. We didn't meet Anna Maria, but I can't say enough about Roberto's helpfulness and hospitality. Thank you!